It’s middle America, and Omaha is a creative oasis – home to the region’s only chapter of CreativeMornings, an international coalition of designers, poets, sculptors, musicians and more – a chapter with nearly 900 local, volunteer members in collaboration for just two years. “We’ve all heard how fragmented Omaha is demographically,” says Herb Thompson, instructor, speech center consultant, School of Communication, University of Nebraska Omaha. “It would be easy to look at Omaha from that lens, but if you did you would miss a fascinating layer that isn’t represented in those divided maps. What I see and experience in the Creative Omaha Community is vastly different. Thompson is not alone in his experience. Omaha is exploding with imaginative entertainment and artistic options, thanks to a burgeoning creative community. From Hot Shops Art Center (home to more than 80 artists’ studios – the largest collective of its kind) to Omaha Fashion Week (the nation’s fifth largest fashion event), Omaha is the 2018 No. 6 (medium-sized) Most Vibrant Arts Community in America, according to SMU DataArts, and serves as a millennial magnet, a top destination for talented individuals hoping to get their start. Yahoo Finance even goes so far as to dub the Metro the No. 2 city millennials should consider for optimal careers. Those career opportunities don’t get any better than in the Omaha arts scene, where the Holland Performing Arts Center is heralded for its stellar acoustics, Joslyn Art Museum offers free admission (and views of masterwork art) and CreativeMornings Omaha is thriving. “Creativity is the expression of imagination. Ideation is the litmus test of creativity. Each of us brings unique ideas to the table and that’s why inclusion is important. The opportunity to collaborate, create and dream is infinite,” says Alan Tipp, local designer. Omaha is for everyone, and surrealist poet Frank O’Neal, an Omaha resident, believes he knows why, “At its core, the viability of a community is reflective of its creative community,” he says. Omaha-based singer/songwriter Edem Garro echoes O’Neal’s remarks, “I believe most artists here will tell you that Omaha is unique. Collaboration is just a person away, and there is always someone you can learn from. In the growing Art & Music community here, many Omahans recognize that growing in the direction of honesty, understanding and support in today’s world is the driving force that will keep us together. 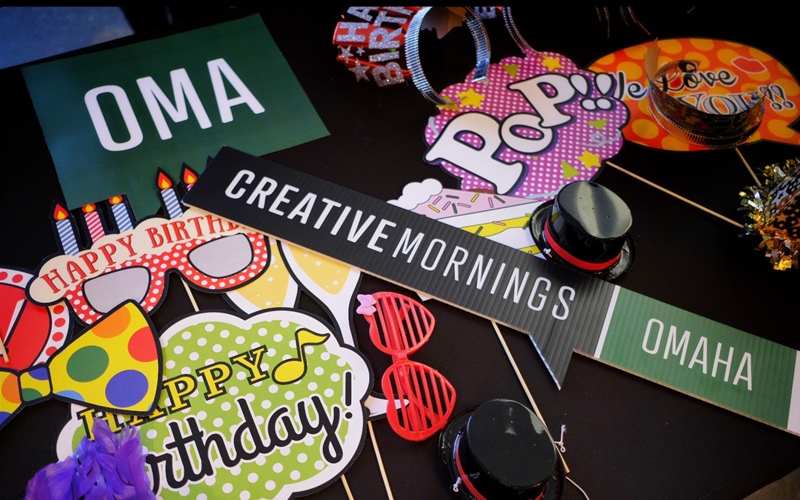 CreativeMornings Omaha will celebrate its second anniversary November 9 from 8 – 9:30 a.m. at KANEKO. The no-cost event is open to the public, and will feature four speakers on the theme of “restart,” as well as a continental breakfast and live music by Jaguar James.